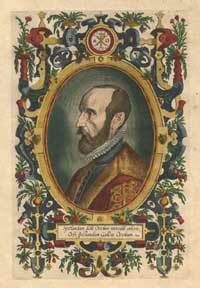 Abraham Ortel (Ortelius) is regarded as one of the most prominent cartographers of the sixteenth century. Born in Antwerp where he was educated in the classics and mathematics, he began his career in cartography as an illuminator or 'painter of maps' and opened a bookstore in partnership with his sister. In the course of his business, he traveled throughout Europe and established important contacts with cartographers and other literati. Between 1564 and 1570 he produced several of his own maps including a large map of the world on eight sheets. It was not however, until the publication of the Theatrum Orbis Terrarum (Theatre of the World) in 1570 that Ortelius' place in history was assured.